The athletes competing this month in the 1988 Winter Olympics in Calgary will depend on their natural ability and drive. But, the difference between a gold medalist and an also-ran could boil down to training and equipment. Technology could turn out to be the unsung hero of the Winter Games. them the latest in sports technology. Figure skaters, for example, wear transmitters during practice routines that track their heart rates, which helps their trainers and coaches monitor fatigue. Obviously, hockey players and luge teams have never trained the same way, but now even athletes engaging in similar events follow a highly personalized program geared to individual needs. gists, nutritionists, and others study every aspect of athletic performance, aided by computers, advanced sensors, and video and photographic equipment. By getting a better grip on what actually happens within the body during an athletic performance, they can learn how to help athletes compete better. For example, USOC researchers collect and study the electrical activity within muscle groups in order to understand the relative importance of a given muscle in a specific activity. Electromyography (EMG), as this field is known, helps dictate the best possible training scenario. therapy machines for sports training and rehabilitation. Research like this has the added benefit of preventing some injuries. "High-level athletes, because they work out so hard, run the risk of injuries caused by muscle imbalance," says Doug Oxsen of Universal Gym Equipment, Cedar Rapids, IA. Correct training lessens that risk. If Gideon Ariel had his way, all trainers would use a cohesive, multidisciplinary approach. 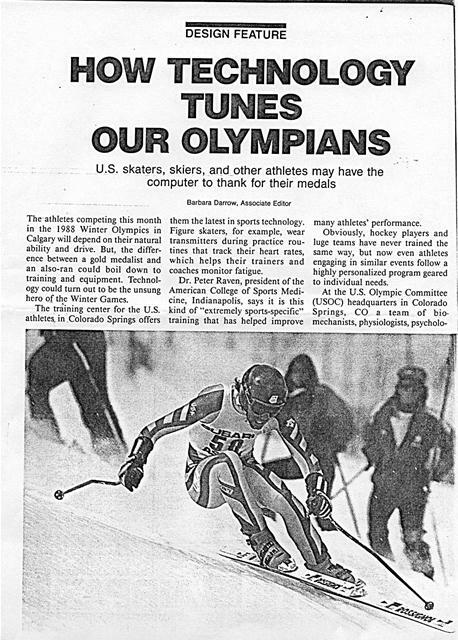 Ariel, president of Ariel Dynamics, Inc., Trabuco Canyon, CA, worked for the USOC before the 1984 games. Now he develops training equipment and consults with professional sports teams, including the Denver Broncos, Kansas City Royals, and Texas Rangers. "Athletic training should follow NASA's model," says Ariel. "When they decided to go to the moon, they had physicists, psychologists, educators, and nutritionists all working together, with each group contributing its own expertise." Ariel helped train the U.S. women's volleyball team before the 1984 Los Angeles games. He and then-coach Arie Selinger used highresolution cameras to film play. By digitizing the images, they could analyze the style, timing, and motion of each player. Important variables such as hit velocities, jump heights, and reaction times were all quantified. By studying this data, he pinpointed frailties and recommended corrective measures. "That team should probably have been 15th in the world," Ariel admits now, "but with training and expertise, Selinger took them from nothing to number 2." U.S. skiers including Jeff Olson, use advanced techniques to train for Winter Olympics. Photo: Kris Erikson, USOC. Joe Barite, member of 1984 U.S. Luge team, works to perfect new start procedure on simulated luge ramp. Timing lights measure velocity. Photo: Kris Erikson, USOC. the center's technological resources. For fatique testing, a skater wears a miniature transmitter on her chest. As she performs her routine, the device transmits her cardiac function to a receiver, similar to a watch worn on her wrist. That data is later "dumped" into a mainframe or portable computer, supplied by Data General. Research showed that many skaters reach their maximum heart rate within the first minute of a fourminute routine. At that point they still have to perform their most difficult jumps, which tend to fall towards the end. Sometimes skaters concentrate so much on form and style that they forget about basic, overall fitness. Once the skater knows where the problem lies, she can concentrate on endurance training. studying the films of her performance and test results, the trainer ascertained that the problem lay in her arms. her spin. She physically could not do that." USOC studies have shown that luge competitions are won or lost in the first 20 ft of the race: the team with the best push-off technique has an immense advantage. Going on that information, USOC biomechanists developed a new "paddlewalk" push-off to maximize traction and speed. With an odd-looking shoulder rotation, the sledders actually walk on their knuckles during take off. Special spiked gloves were developed to further maximize take-off speed. Similar techniques have helped athletes train for the Summer Olympic Games in South Korea. Olympic marksmen, for example, shoot at a 4-inch target 50m away. To get a perfect score, they have to hit the innermost of seven rings on that target 10 times out of 10, without a scope. "Even the shooter's heartbeat will knock them off two rings," says Westenburg. The Sports Engineering Group, which he heads, developed a laser system to help shooting accuracy. The participant shoots an invisible infrared laser instead of a bullet. A camera off to the side is trained at the barrel of the "gun." Another picks up the IR beam hitting the target. Amateur and professional athletes increa ingly rely on computerized training equi ment. LEDs on Life Fitness arm curl machir move up and down in sync with lifted weigh giving user visual feedback. of shooter and hit are then con pared and results correlated. Electrical muscle stimulation (EMS) has caused quite a brouhaha in training circles. Basically, EMS is the administration of electrical current to muscle groups through skin electrodes. The current causes an involuntary muscle contraction. Proponents claim that by repeating such contractions, muscle mass-and hence strength-is enhanced. Naysayers counter that the technology is overrated, blown out of proportion by health spas claiming to offer "sweatless workouts." "When someone says you can lie on a table for 30 minutes and get a workout equivalent to 2000 sit ups, that's just baloney," says one prominent physiologist. 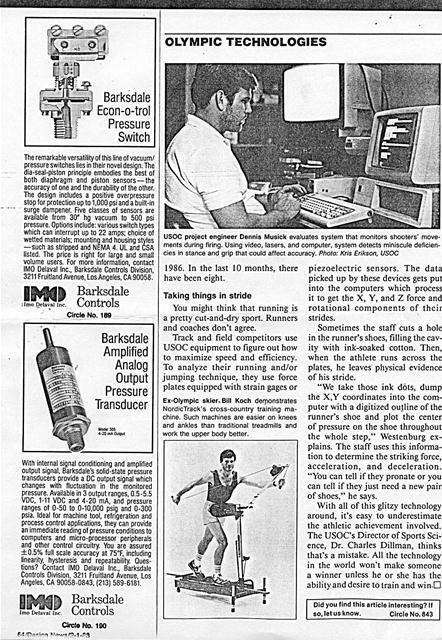 Still, some trainers and physical therapists are not ready to write the technology off, especially since there are persistent rumors that Russian and East German athletes use EMS extensively with impressive results. One Russian study claims that EMS increases muscle performance significantly but no one else has been able to duplicate these results. "At that point, the contraction itself becomes problematic," says Terry Malone, associate professor of sports medicine at Duke University in Durham, NC. Until recently, EMS was largely an isometric process: The subject is kept stationary by restraints. The limb receiving stimulation strains against a stable brace. Lately, researchers are looking at a more isokinetic process in which the subject can move more freely. In that scenario, her contractions are not restrained. "By allowing movement, we can dissipate some of those damaging forces," says Malone. There is talk that an athlete who combines EMS with regular exercise might get a better result than by using either technique alone, citing a "superimposition effect." "You superimpose the stimulated contraction over a voluntary contraction and get increases beyond what you would get with one contraction alone," Malone explains, cautioning that no research has backed this up yet. also causes the muscle to stretch or lengthen voluntarily (an eccentric contraction), the interaction could conceivably build or maintain muscle mass better than conventional exercise alone. The problem researchers have found is that EMS seems to affect people differently. Some subjects react positively, some are neutral, and some actually show decreased muscular capacity after using it. 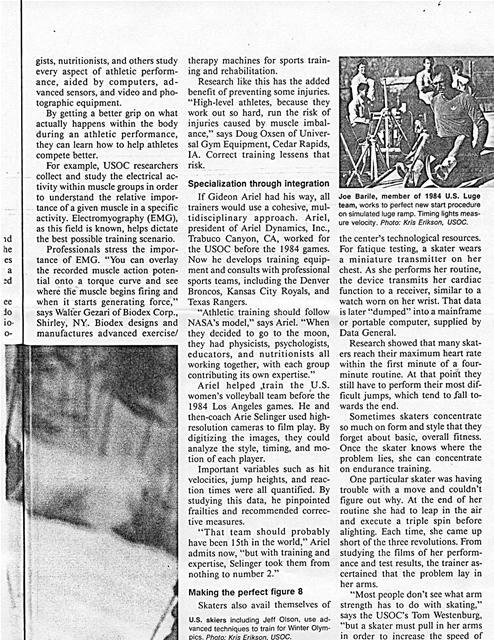 Vincent Convertini, a NASA physiologist, thinks that EMS could help capsule-bound astronauts retain muscle tone or at least retard atrophy during long periods of inactivity. But he feels that a worldclass athlete trying to train with it is "wasting his time." 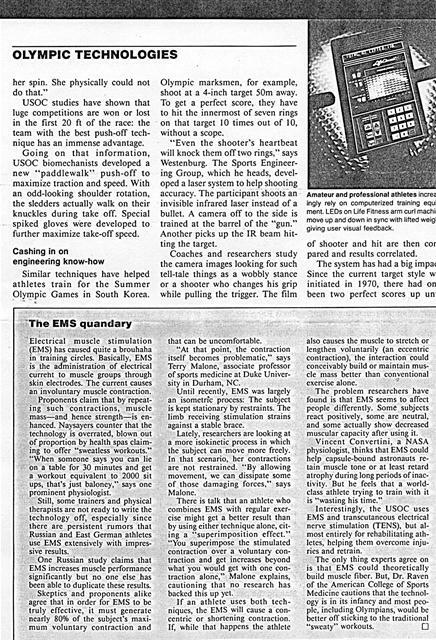 Interestingly, the USOC uses EMS and transcutaneous electrical nerve stimulation (TENS), but almost entirely for rehabilitating athletes, helping them overcome injuries and retrain. The remarkable versatility of this line of vacuum/ pressure switches lies in their novel design. The dia-seal-piston principle embodies the best of both diaphragm and piston sensors-the accuracy of one and the durability of the other. The design includes a positive overpressure stop for protection up to 1,000 psi and a built-in surge dampener. Five classes of sensors are available from 30' hg vacuum to 500 psi pressure. Options include: various switch types which can interrupt up to 22 amps; choice of wetted materials; mounting and housing styles -such as stripped and NEMA 4. UL and CSA listed. The price is right for large and small volume users. For more information, contact IMO Delaval Inc., Barksdale Controls Division, 3211 Fruitland Avenue, Los Angeles, CA 90058. With internal signal conditioning and amplified output signal, Barksdale's solid-state pressure transducers provide a DC output signal which changes with fluctuation in the monitored pressure. Available in 3 output ranges, 0.5-5.5 VDC, 1-11 VDC and 4-20 mA, and pressure ranges of 0-50 to 0-10,000 psig and 0-300 psia. Ideal for machine tool, refrigeration and process control applications, they can provide an immediate reading of pressure conditions to computers and micro-processor peripherals and other control circuitry. You are assured 10.5% full scale accuracy at 75ï¿½F, including linearity, hysteresis and repeatability. Questions? Contact IMO Delaval Inc., Barksdale Controls Division, 3211 Fruitland Avenue, Los Angeles, CA 90058-0843, (213) 589-6181. 1986. In the last 10 months, there have been eight. You might think that running is a pretty cut-and-dry sport. Runners and coaches don't agree. and ankles than traditional treadmills and work the upper body better. 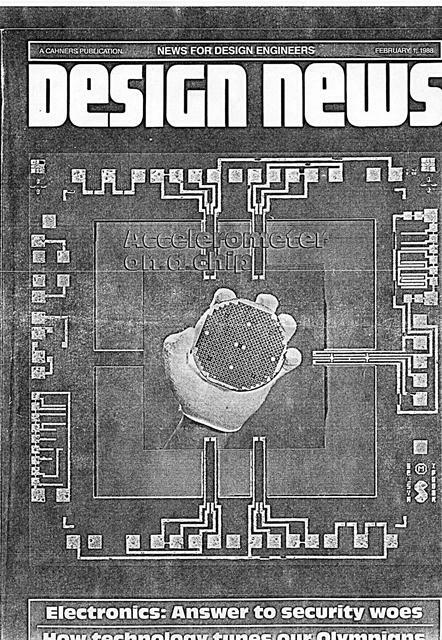 piezoelectric sensors. The data picked up by these devices gets put into the computers which process it to get the X, Y, and Z force and rotational components of their strides. Sometimes the staff cuts a hole in the runner's shoes, filling the cavity with ink-soaked cotton. Then, when the athlete runs across the plates, he leaves physical evidence of his stride. "We take those ink dots, dump the X,Y coordinates into the computer with a digitized outline of the runner's shoe and plot the center of pressure on the shoe throughout the whole step," Westenburg explains. The staff uses this information to determine the striking force, acceleration, and deceleration. "You can tell if they pronate or you can tell if they just need a new pair of shoes," he says. Generated on 4/25/2019 11:21:56 AM (PST) ADI/HQ/GBA/2019/ARIELCLOUD/v3.0.2018.0126.